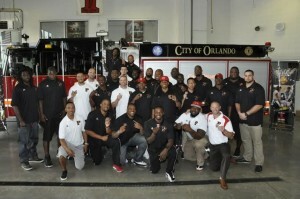 ORLANDO, FL – The Orlando Predators became the first professional Arena Football League team in America to become trained and certified in the critical skills of Cardiopulmonary Resuscitation (CPR) and how to use an Automated External Defibrillator (AED). The training was facilitated by the Orlando Fire Department at downtown Fire Station 1 on Monday, March 10. The training, which is part of the national emergency preparedness program, is known as ATHLETES FOR AMERICA. ABOUT ORLANDO PREDATORS: The team plays in the Arena Football League among fourteen total teams in the AFL. The Predators are going into their 23rd season and have appeared in the playoffs 19 times and have gone on to play in the ArenaBowl seven times, winning the championship in 1998 and 2000.